Last year, scientists identified five mutations of the bird flu virus, H5N1, that make the disease highly transmissible among ferrets. The scary part? Humans have a similar immune vulnerability. The controversial research sparked a debate over whether potentially dangerous information should be public knowledge. 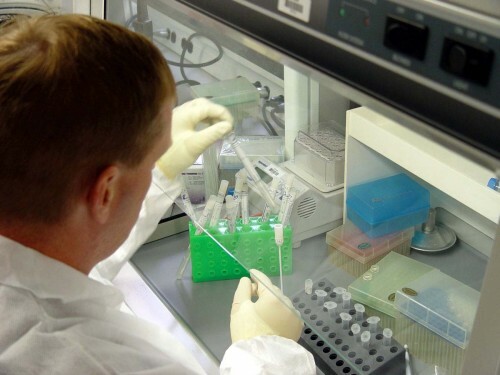 Although some believed that the world needed the biomedical research to determine proper public health measures, critics argued that releasing information would potentially allow rogue scientists to concoct deadly H5N1 strains for bioterrorism. Although, research on using biology as warfare has a relatively short history in comparison to the history of traditional weaponry, biological warfare has proven to be just as powerful. Bioweapons are infectious agents or artificially made toxic substances that can kill or weaken humans. State or non-state actors have used bioweapons to gain tactical advantage over their enemies. Courtesy of X Comp Online Products. Biological warfare is the use of infectious agents or artificially made toxic substances that kill or weaken humans, animals, or plants. Unlike chemical weapons, biological weapons are living organisms or replicating agents that reproduce within their victims. These microbes may be deadly or incapacitating and may affect specific individuals, a community, or an entire population. Given their lower costs of production and storage, biological weapons can destroy populations at much higher rates than their nuclear, chemical, or conventional counterparts. Relative to nuclear energy, biological weapons are easily produced and obtained by non-experts. Development, however, is much easier than deployment. Aerosols and bombs are the most common methods of releasing these infectious agents. Yet the technology is imperfect, as microbes can be fragile and difficult to control once released. For some plotters, the unpredictable and uncontrollable nature of infectious diseases actually make bioweapons that much more useful and terrifying. Biological weapons can also target non-humans. Anti-agriculture weapons, such as “rice blast” fungus, can wipe out food supplies of an enemy nation. Anti-livestock biological warfare similarly targets cows, chickens, pigs, horses, mules, and other animal resources for transportation and food. Infectious disease is an effective weapon for two reasons: it kills, and it stirs fear even when not deadly. In other words, it is not only the disease the bioweapon may spread that is contagious: fear is even more easily transmitted. Fear of catching the disease, of dehumanizing symptoms, and of permanent physical or emotional damage can lead to the overturn of societies. Some choose non-contagious infectious agents for biological warfare, as these bioweapons can be powerful in other ways. In 2001, letters full of inhalation anthrax infected 22 people and killed five. Anthrax is a bacterial spore that naturally occurs in the soil, where animals usually encounter the bacteria while grazing. When inhaled by humans, the bacteria travel to the lungs and eventually to the lymph nodes, where spores multiply and release toxins that cause fever, respiratory failure, fatigue, muscle aches, nausea, vomiting, diarrhea, and black ulcers. The bacteria are extremely deadly. Inhalation of anthrax kills 100 percent of the time when untreated and 75 percent of the time even with medical aid. Anthrax is also highly storable, with a shelf life of over 40 years. Given the low-risk for the population overall, only high-risk people such as health workers, military workers, and veterinarians receive the vaccine. But low-risk is not equivalent to “no risk,” and so we still have reason to fear anthrax. In the twentieth century, scientists and the government actively developed biological weapons. In 1934, Japanese military physician General Shiro Ishii created a biological warfare program that would eventually weaponize infectious disease for the first time in the century. The scientists at “Unit 731,” a large-scale facility of laboratories, detention camps, insect houses, animal houses, airfields, and barracks in occupied Manchuria, experimented with anthrax, typhoid, dysentery, and plague on their prisoners to find the most effective biological weapons. Using the research of Unit 731, the Japanese military dropped porcelain bombs of fleas infected with plague on the Chinese cities of Ningbo and Changde. Other nations also saw biological weapons as a means of national self-defense, though this was often based on a misunderstanding that the enemy had more advanced biological warfare programs. As early as the end of WWI, France began developing biological weapons programs due to fear that Germany had biological weapons. Between the World Wars, biological warfare took a backseat to chemical warfare for the Western powers, while Stalin politically repressed biological research. With the onset of the Cold War, however the U.S. and U.S.S.R. began to research biological warfare once again, sparking a rivalry in scientific knowledge that would last throughout the Cold War. From the Potsdam conference until the fall of the Berlin Wall, the U.S. and U.S.S.R. engaged in an “arms race” of biological weapons with constant fear that the enemy was getting ahead. 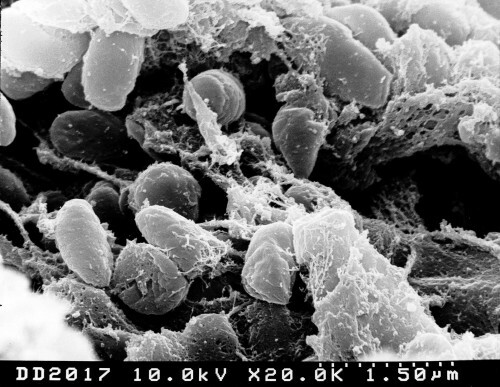 Yersinia pestis, or the black plague, is history’s deadliest epidemic disease. In the 14th century, the Black Death killed one-third of Europe’s population. The plague remains one of the world’s most threatening bioweapons today. Courtesy of the National Institutes of Health. As it turned out, scientists are not immune to politics. Unbeknownst to the general public, American scientists and physicians experimented with various infectious diseases as possible bioweapons. In the 1940s, scientists at Fort Detrick experimented with anti-crop agents, anthrax, and brucellosis. With virtually no oversight from government agencies, the military, or Congress from the 1960s into the Vietnam War, scientists and physicians conducted tularaemia research on volunteer servicemen with the goal of creating an aerosol weapon for anti-civilian attacks in Vietnam. Only when President Nixon faced pressure from civilian scientists to reform the government’s chemical and biological warfare research policy did the U.S. begin to move away from offensive biological weapons. The terrorist attacks in 2001 prompted a new age in biological warfare in the U.S. Since 2001, we have invested more than $60 billion in developing air sensors, educating doctors about symptoms of bioweapons and distributing biodefense materials. Biodefense experts have identified smallpox as the most threatening biological weapon because it is as contagious as the flu and kills 33 percent of its victims. By 2011, the U.S. had grown its stockpile of antidotes to more than 300 million treatment courses in the event of a smallpox outbreak, and biodefense research is now working on an anthrax vaccine. The mass production and build-up of bioweapons has been illegal since the 1972 Biological Weapons Convention. But only 165 countries have signed the treaty, which means that other nations and non-state actors may still choose to use bioweapons. Thus, many countries conduct defensive bioweapon research to learn more about dangerous biological agents. Research in general supports public health efforts against naturally occurring outbreaks and potential bioweapon attacks. Supporters for the controversial H5N1 research argued exactly this to justify publishing the controversial findings. In the study published in Science, scientists at Erasmus Medical Center in the Netherlands had identified five mutations that make bird flu very contagious among ferrets, which catch the same flus as humans do. They argue that the benefits of allowing the world to design the most effective strategies to defend against the disease outweighs the potential risks of bioterror. Censorship would have set a potentially harmful precedent. The National Science Advisory Board for Biosecurity, a U.S. government agency, was the leading critic of publishing the papers. Although the U.S. eventually reversed its stance under international pressure, censorship would have signaled a charged message about the role of politics and government in what is supposed to be an unbiased field. The H5N1 controversy reminds us that scientific knowledge is a double-edged sword — it can empower those who want to conquer disease and those who wish to exploit it for sinister purposes. Scientists can research biological weapons for defensive, but not offensive purposes. Proponents of this policy argue that understanding diseases will better prepare us in the event of a biological attack. Courtesy of the High Scope Program.